tRetro-Visor, wow, that's a lot of oxygen! It would actually poison you over a few days. The CO2 and SO2 would kill almost immediately. 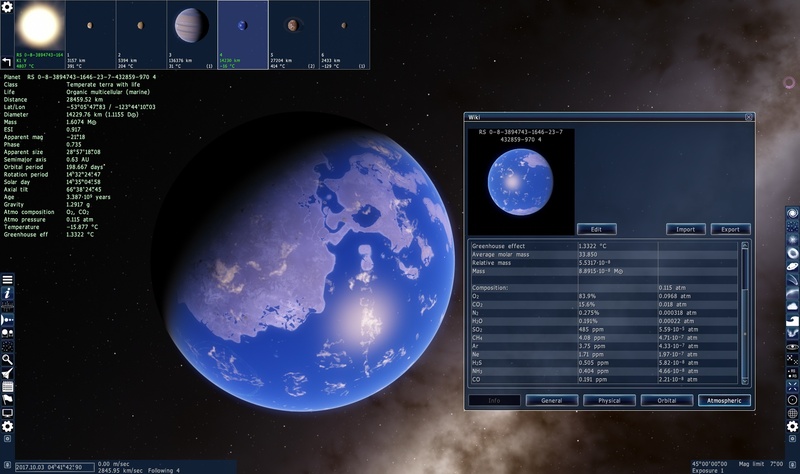 A good rule of thumb is that if SO2 appears at all in the planet's overview (the main screen text, not the info/wiki tab), then it can't be breathable. This is because a gas is listed there if it makes up at least 1% of the atmosphere's composition. We need at least 0.1atm of pressure for air to possibly be breathable (100% pure O2 at 0.1atm), and 1% SO2 out of 0.1atm is 0.001atm partial pressure of SO2 which would kill very quickly. Has anyone found a truely earth like planet? Sorta the point of this thread. For certain values of 'truly' and 'Earth-like'. People have found planets that are more or less similar to Earth, but it's insanely difficult to find a very close match. There more we look the closer we might get. I found a few close ones, but they are probably deadly. Oh wow, that first one is a really good find. I've not found any terras better than that. The only major problem is the SO2 as usual -- it would kill within an hour. The oxygen is similar to being at 2400m altitude, which is fine. CO2 level might cause a bit of drowsiness, but otherwise fine. CH4, I'm not really sure, but it doesn't appear to be lethal. The H2S would have an odor and may cause some nausea and stuff, but it wouldn't kill you. If instantly made reality, would any of these atmospheres combust due to the oxygen level, or has SpaceEngineer coded the atmosphere properties to not return such a thing? Alek, the atmosphere generator code is still very primitive, so I doubt it takes into consideration this. Found something different. It has a really low atmosphere pressure and is cold though. 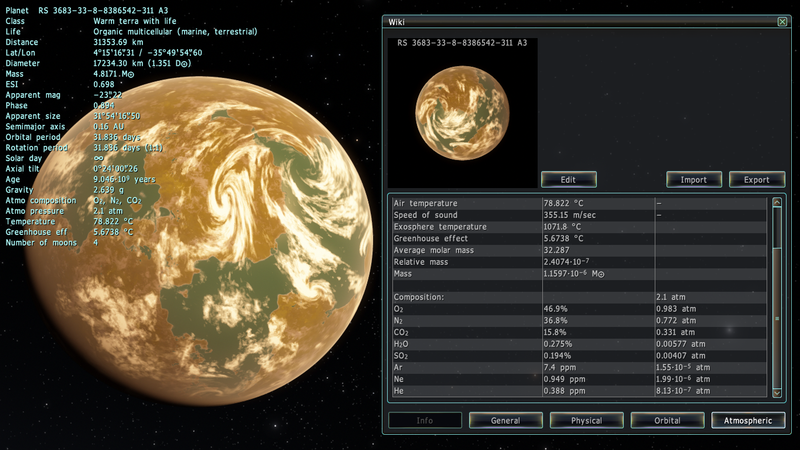 Found a temperate terra with an atmosphere that is survivable for about one hour, and is relatively safe for about 10 minutes. It wouldn't be a very pleasant time. As usual, blame SO2. The O2 level is right below the limit of what we can permanently adapt to, and is similar to being a bit above 6000m elevation on Earth. Overall though, this is a step in the right direction -- very close to breathable air on an Earth-like planet. Well you could use gas masks or something to block out the SO2. SO2 is aways the party pooper .